When you purchase your poodle puppy you need to find dog doctors to take care of your pet's health. Dog docs are called veterinarians, and every poodle needs one. If you live in a very small town, there may only be one vet to take her to. But if you have a choice, there are ways to go about finding the vet both you and your poodle are comfortable with. Ask your breeder and friends with dogs who they go to. The vet's office shouldn't be too far away in case of emergencies. The vet should be personable and have a good reputation. A small practice offers personalized attention as you will see the same vet over and over. A larger practice or animal hospital may rotate vets and you may not have the same one each time. You can ask a vet questions online 24 hours a day, 7 days a week. This online service charges a small fee for you to ask your question and get answers from a veterinarian. Find out how after hour emergencies are handled. A multi-doctor practice or hospital will usually have on-call vets. 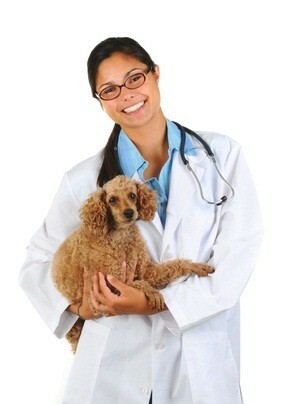 A single doctor practice may refer you to the local animal hospital, another vet or have you page him after hours. You'll want to learn the serious signs of illness and when it is absolutely necessary to call the vet right away. Emergency situations require urgent trips to the doctor. Decide if you want a regular vet who dispenses medications or a natural dog health vet who works with alternative medicines and dog health supplements like herbs. There are also vets who do acupuncture. Once you decide on a vet, visit the office to talk to the staff and vet. Be sure they are courteous to you and the animals. Make sure the office and examine rooms are clean. How do the other animals react to the vet? Is he gentle and compassionate with them or rough and inpatient? Are you comfortable asking him dog health care questions? 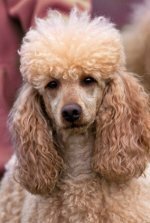 Ask the vet what dog vaccinations he gives and how often, if he offers naturapathic healthcare, and what percentage of his patients are poodles. Ask him if he's familiar with the poodle's genetic predispositions. Ask him if he's up to date on the latest technologies and if he has the necessary equipment in his office. Does he specialize in any area? Vets can specialize in dog heart, skin, teeth, and eye problems. They can also be surgeons and x-ray radiologists. 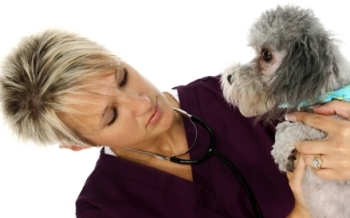 Be selective in choosing dog doctors as your pet's health life will be in the vet's hands. Both you and your poodle should be comfortable with the veterinarian as he'll be in your dog's life up to 18 years.